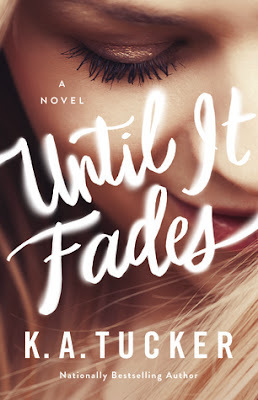 Until it Fades is the very first book I've ever read by K.A. Tucker, though I have quite a few of her books on my TBR. I've wanted to read something by her for quite a while now, and Until it Fades sounded like the perfect book to start with. And it was! The book is full of all kinds of interesting characters, including the main character, Catherine, who has quite the back-story. You can't help but feel for the girl for all that she has been through, and I was able to relate to her in quite a few ways. I definitely appreciated her determination throughout the book, especially when it came to her daughter. And I kind of love Brett Madden for entering her life and turning everything around. The relationship between the two is really sweet, and put a smile on my face more than a few times. The storyline for the book was really interesting, and made for a very quick read. It's a contemporary novel, which is my most favorite genre, especially lately, and it was a little predictable, but it was just what I needed to read at the moment. I really enjoyed reading the book, and I kind of didn't want it to end! Overall; Until it Fades was an interesting read, and I'm thrilled to have finally read something by K.A. Tucker. I'm even more excited to read the rest of her books that are on my TBR now, and I'm hoping to get to some of them soon!